[caption id="attachment_10013" align="alignleft" width="400"] Small businesses have plenty of opportunities to use social media influencer marketing if they just know where to look. [/caption] You’ve surely heard of social media influencers. Those famous folks that brands partner with to expand their reach and promote their products on social media. Some of the biggest influencers – like Beyoncé and Kim Kardashian – can command up to $1 million for ONE SINGLE SOCIAL MEDIA POST, because they reach millions of followers in just one click. As a small business, you probably don’t have $1 million to plop down on a single social media post. But you can still use social media influencers to reach more potential customers ... and it might not cost you anything at all. Seen an ad lately? Of course you have. They are EVERYWHERE – and that’s why we’ve all learned to tune them out. Social media influencers are the modern day “product placement,” subtle advertising that doesn’t FEEL like advertising – so you still pay attention. And where do you put ads so people will see them? Where they hang out. Which, today, is online. Everyone is on social media – all ages, genders, faiths, backgrounds, you name it. Never before in the history of advertising have you had the opportunity to reach so many people in your target audience at the same time. When people follow a social media influencer on Facebook, Twitter or Instagram, they do so because they TRUST and BELIEVE IN that person in one way or another. Maybe they trust their advice as an expert in their field. Maybe they see this person living the kind of life that they want. So they follow them hoping to copy their actions. One way or another, followers feel a connection to the influencers they follow. So when they suggest YOUR product, it’s nearly the same (and even more powerful) as getting a first-hand recommendation from a friend. There are plenty of potential social influencers that you can use as a small business. You just have to know what to look for. Don’t be afraid to use micro-influencers - Though big stars might have millions of followers, their posts don’t incite as much action simply because their audience is so broad. Micro-influencers, on the other hand, tend to have a more close-knit group of rabid fans that are more likely to actually go out and buy a product if it’s suggested. Look for people who are in your industry or a complementary business - If you sell health food, for example, you could partner with people in the natural medicine, fitness, or alternative health industries. If one of your selling points is “buy local,” you could partner with other local businesses. The point is – find someone whose customers would want to buy your product, too. Your influencers are representing you publicly so DO YOUR RESEARCH - The very last thing your business needs is to be involved in some kind of scandal. Take your time and vet any influencer you are considering comprehensively. Look for any behavior or ideals that your customers could find offensive or excluding. And yes, politics count. Look in your own back yard – You may already be connected with potential brand influencers on Facebook, LinkedIn, or Instagram. Check any business associations you belong to and the local Chamber of Commerce. 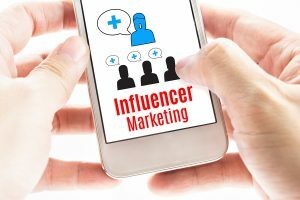 You found your influencers… now what? Get creative – there’s no limit to what you can do! Need help getting your social media on point? We’d love to help you showcase your business online in a way that reaches right into your customers’ hearts … and pulls out their wallets. Get started today with a FREE 1-hour strategy session. Just give us a call today at 877-236-9094 or visit us online at www.GetUWired.com.